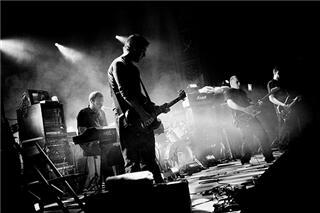 "How to Be a Werewolf"
Mogwai are a Scottish post-rock band, formed in 1995 in Glasgow. 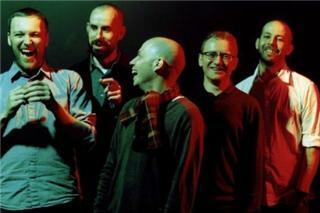 The band consists of Stuart Braithwaite (guitar, vocals), John Cummings (guitar, vocals), Barry Burns (guitar, piano, synthesizer, vocals), Dominic Aitchison (bass guitar), and Martin Bulloch (drums). The band typically compose lengthy guitar-based instrumental pieces that feature dynamic contrast, melodic bass guitar lines, and heavy use of distortion and effects. The band were for several years signed to renowned Glasgow indie label Chemikal Underground, and have been distributed by different labels such as Matador in the US and Play It Again Sam in the UK, but now use their own label Rock Action Records in the UK, and Sub Pop in North America. Rock Action records is named after Stooges drummer Scott Asheton, who had his name changed to Rock Action. The band were frequently championed by John Peel from their early days, and recorded no fewer than seven Peel Sessions between 1996 and 2004. Peel also recorded a brief introduction for the compilation Government Commissions: BBC Sessions 19962003.